Where the .22 rifle shines! Sporter Class shall be comprised of production repeater rifles chambered for .22 LR only. The actions and stocks must be factory made, and factory safeties must be intact and functional. Weight of rifles with sights not to exceed 8.5 pounds. No restrictions on scopes. Rifles may be glass bedded, but neither actions nor barrels may be glued in. Triggers may be adjusted or replaced, and rifles may be rebarreled as long as barrel(s) is (are) same contour and length as original. Rifles may be out of production as long as 1,000 were made in the original production run. No muzzle brakes, barrel tuners, or external forend stabilizing plates. Semiauto Class shall be comprised of production semiauto rifles chambered for .22 LR only. Actions, stocks, and barrels may be custom as long as actions are based on original production actions. Safeties must be intact and functional. Weight of rifles with sights not to exceed 10.5 pounds. No restrictions on scopes. Rifles may be glass bedded but not glued in. Triggers may be adjusted or replaced. No muzzle brakes, barrel tuners, or forend plates. Match Rifle Class shall be comprised of any rifle chambered for .22 LR only. Weight of rifles with sights not to exceed 13.5 pounds. Rifles must be safe to operate, and must be able to be made incapable of firing on command. No other restrictions. At the discretion of the Match Director, matches may consist of Stage One, in which competitors will engage two NBRSA HBR-1 targets (HBR-2 targets for the semi-auto Class) mounted side-by-side and engaged in order and during the same time period at a distance of 50 yards with unlimited sighters and five-shot groups (50 total record shots) fired into each of the ten record bulls within a time limit of thirty minutes total for both targets, and/or Stage Two, in which competitors will fire unlimited sighters and 25 total record shots (one round into each record bull) into an IBS-50 target at 50 yards within a time limit of twenty minutes. Pedestal rests may be used in any classification as long as rifles can be lifted straight up from the rest. Rests may not be attached to benches. Machine rests and return-to-battery are prohibited. All rifles must rest on sandbags front and rear. All firing will be done from a bench with the shooter seated. Ties will be decided by X count. Entry fees shall be $2 per rifle per classification. 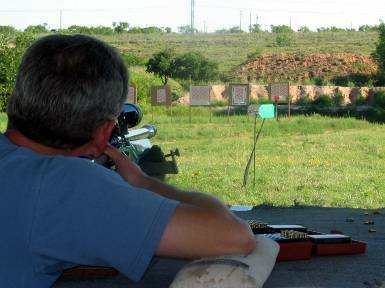 If one rifle is used in two classifications, two entry fees shall be paid for that rifle. The Match Director shall decide cash prizes as entry fees permit. A portion of the entry fees not to exceed half the paid fees shall be retained by the Match Director at his discretion for purchase of targets. There will be no handicap system employed. All matches will begin promptly at 10:00 a.m. Range closes at 9:00 a.m. for sight-in. Matches are scheduled for the first Saturday of each month, May through November. For additional information, contact the Smallbore Benchrest Match Director listed on the Contact Information web page. All safe shooters are welcome, including Juniors!